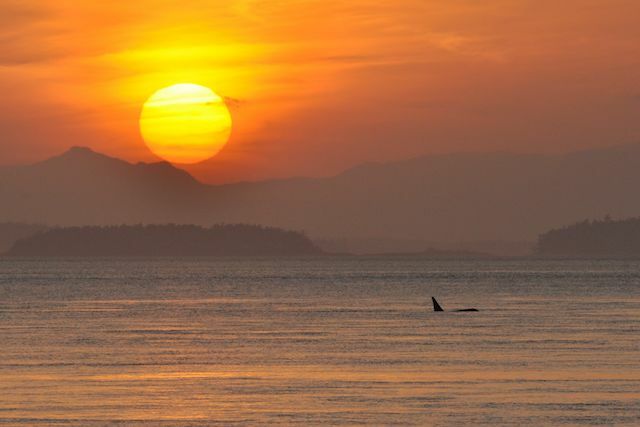 As I had hoped, the whales did come in on Tuesday night, though it was after dark by the time they reached the shores of San Juan Island. They went north during the night, and made their way back south towards the westside of San Juan yesterday afternoon. They passed the lighthouse heading south, but I wasn't there to see them, being busy watching Game 4 of the Stanley Cup Finals (here's hoping Vancouver finds a way to right the ship, in a hurry!). After the disappointing hockey game, we decided to go to the westside and see the sunset and see what we might see. When we arrived in the parking lot at Lime Kiln Lighthouse, I said, "I think we're going to see something awesome." I turned out to be right! I love seeing the whales - and I love seeing them even more at sunset, when they're close, when it's unexpected, and when it's quiet. Last night's whale encounter was all of those things. It was a special moment, one of those whale encounters that really rejuvenates the spirit. Nice but of video there Monika - shame my BNDs this morning weren't close enough to do same. Oh Monika, thank you for this posting! I feel like I shared a sliver of that lovely evening, and it is such a fine way to begin my day. And the surprise spyhop at the end of that vid! What a sweet finish. I'm going to repost this on my facebook page, hoping some of my friends will come check out your blog. Your last image is just gorgeous!